I am a Doctoral Candidate at Utah State, where I study bees with Terry Griswold and James Pitts. 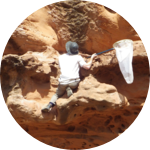 My dissertation research involves the taxonomy, systematics, and biogeography of the bee group Anthophora; the mechanisms and effects of specialization on specific host plants; and where and how bees nest, especially in extreme habitats such as in sandstone and on the rim of volcanoes. Stemming from a lifelong interest in insects, I completed my undergraduate degree in Entomology at Cornell University. There, I worked in Dr. Bryan Danforth’s lab as a member of the Apple Pollinator Project. Furthering my newfound interest in bees, I spent a year before graduate school working as a Smithsonian Institution Collections Intern for Dr. Seán Brady and also as a USGS Contractor to Sam Droege. These positions expanded my knowledge of bees, preparing me for my PhD work at Utah State. Following my PhD, I plan to continue my studies of Anthophora pueblo by exploring how the resources this bee requires have shaped its ecology and evolution, and how the species may be impacted by threats like climate change. They're cute, but fast enough that it's really hard to tell. They're almost always on the move. Thanks for backing our project!